A Queensland social enterprise is tackling burgeoning waste from the consumer electronics industry using social enterprise in its “purest” form. Nadia Boyce speaks to a 2015 Social Enterprise Awards nominee in this week's Spotlight. Substation33 disassembles electronic waste and redirects recovered materials back into the manufacturing stream, diverting it from landfill. It doubles as a community resource offering practical volunteering, work experience and job placement opportunities for residents of the Queensland city of Logan. 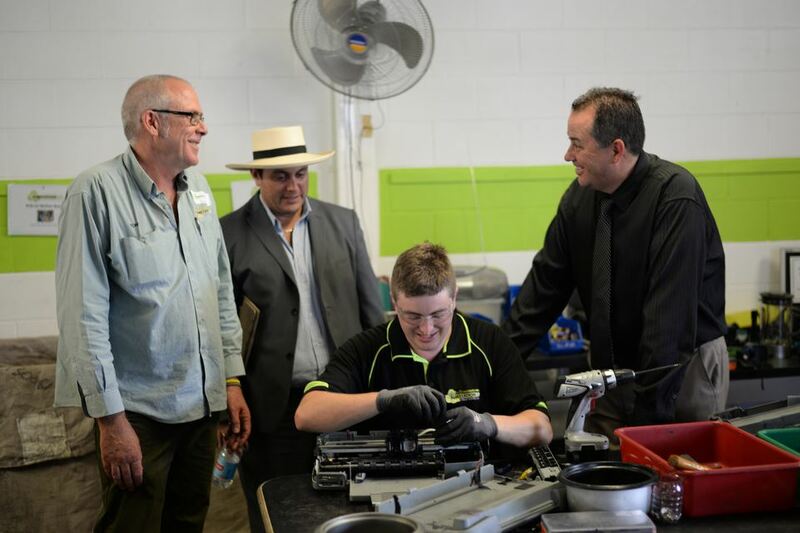 The organisation, a social enterprise of YFS, is a Not for Profit delivering a range of social programs to people in Logan who are disadvantaged or vulnerable. In the past year, Substation33 has managed to disassemble 90,000 kilograms of eWaste and provide 19,300 hours of volunteer employment spread across of 287 people, along with 7,800 hours of additional paid employment. Pro Bono Australia News spoke to Tony Sharp, the Social Enterprise Development Manager at YFS, who explained the model he has developed, his plans for social franchising and why he believes Substation33 is “true blue”. Sharp had a landscaping business in Logan for 20 years, but quit seven years ago to retrain as a youth worker. With a passion for trying to get young people into work or getting them the skills for work, he joined YFS’s youth team, where he restarted his landscaping work as a social enterprise stream for the organisation. “The biggest problem I found in the youth team was that young people didn’t know how to work, but wanted to work,” Sharp says. “In late 2012, YFS came to me and asked if I wanted to do something more in the social enterprise field. Substation33 opened its doors in January 2013 as an electronic waste recycling centre aiming to provide a workplace where volunteers and employees could gain confidence and skills for the transition to sustainable employment. “It operates through the collection, decommissioning, sorting, and selling of electronic waste,” Sharp says. “Some of it is upsold – refurbished and sold – some of it, we break down into its individual components, and they become a commodity, a sellable product. Even plastic, for example, is a sellable product. “We’ve got five full time paid employees, and every one of those, bar myself, came through the ‘system’ – for want of a better word. They started here as a volunteer, have grown and developed and now have paid employment with us. “They don’t necessarily have a disability, but they were unemployed. Everyone who works here has been unemployed for at least five years…We have guys who are long-term unemployed, people with a disability, people with youth justice issues and commitments, people from disability schools, kids from behavioural units in schools. Substation33 has also expanded its work to schools. “We have impact in eight schools. We have eight substations,some in special education and some in mainstream education. At those mini substations, we get electronic waste, we drop it to the kids to disassemble, and they drop it back to us and put it in bins to recycle,” Sharp says. Electronic waste (eWaste) is the fastest growing waste stream to landfill in Australia. “Australia is among the top five highest consumers of electronics in the world, but interestingly, we also have the highest turnover of electronics in the world,” Sharp says. “We keep mobile phones for an average of 18 months, in most countries it’s two or three years. “Currently we only disassemble about 50 per cent [of eWaste], and from that only 30 per cent [of disassembled material] is being recycled and the rest is still going to landfill. So, 70 per cent of our electronic waste is still going to landfill,” he says. “You can see that there’s potential for these types of operations to expand, which is great..
“At the moment, we’re at about 30 percent [diverted from landfill], but in Europe, it’s 95 per cent. In Europe and America, they do what we do here, manual disassembly. They don’t put it through a machine either. Awareness is key, Sharp says. “Electronic waste currently in Australia, it’s amazing, you go into a computer shop and ask them what they do with their eWaste and they say ‘isn’t that landfill?’. So we definitely need to be able to increase awareness of eWaste,” he explains. “People need to be able to recycle with confidence. For example, I believe, and I hear it all the time here at Substation33, that a lot of people don’t trust, for example, the local council who’s going to recycle it. [The public] thinks it’s going to be recycled and it goes to landfill. He says many large electronics firms already have standing arrangements with large corporations who disassemble their waste – but using machines. Asked how he ensures his organisation has ongoing financial sustainability, Sharp’s response is suitably tongue-in-cheek. “Through not getting much sleep at night!” is all he initially offers, before more seriously acknowledging the need to expand operations to the top end of town. Currently the organisation receives no Government funding. Roughly 70 per cent is derived from trading, and the rest from philanthropy. “Constantly financials have been a challenge, plus there are growing pains,” Sharp says. “Make sure you have a good, robust business model, that’s not reliant on funding…grant or philanthropic funding it’s not going to be there forever. “I didn’t expect it to be what it is today, I’ll be very honest with you. I expected to have a couple of tables running, a couple of days a week maybe. It’s like we’ve created the ultimate storm. Sharp says social franchising may be in the future for Substation 33. “I’d like to franchise it. Not for money, but I think it’s one way to increase the impact, which is what it’s about, I suppose. “If you want to increase the impact, this business here is maxed out. We’ve got most of the electronic waste in the Logan area coming through here now. So we’ve got maximum flow and we cannot get any bigger, we’re maxed out for size. So the increased impact would be to duplicate, in the western suburbs of Sydney for example, and get the electronic waste coming through there. Sharp is a strong advocate for what he describes as “pure” social enterprises. “I think some social enterprises could be classed as programs of organisations, but I think Substation 33 is definitely true blue,” he says. “It’s the purest form of social enterprise…because look how many people we’ve had impact on in the last financial year, and as well as that we’re also having an environmental impact. It’s very unusual for a social enterprise to have both social and environmental impact. “I think that a lot of people are on the bandwagon in a way. I’m hoping that people do the right thing and promote true social enterprises, ones that are not programs of community organisations. “Providing we keep ourselves honest as a sector and we have social enterprises blasting away…then I think we’re on a pathway to somewhere. “We also need to change our mindset a bit. We can’t constantly have a hand out wanting money to prop up a social enterprise.